What Brackets Do I Use to Hang a Decorative Oar? Decorative oars bring the outdoors inside. Fill a large wall expanse without a lot of clutter by hanging oars. Whether you're displaying antique oars or looking for a way to store oars you use on a regular basis, choosing decorative brackets to hold them is a key design element to the room. Display the beauty of wooden oars by displaying them on the wall. Choose decorative coat hooks to hang your oars on the wall. 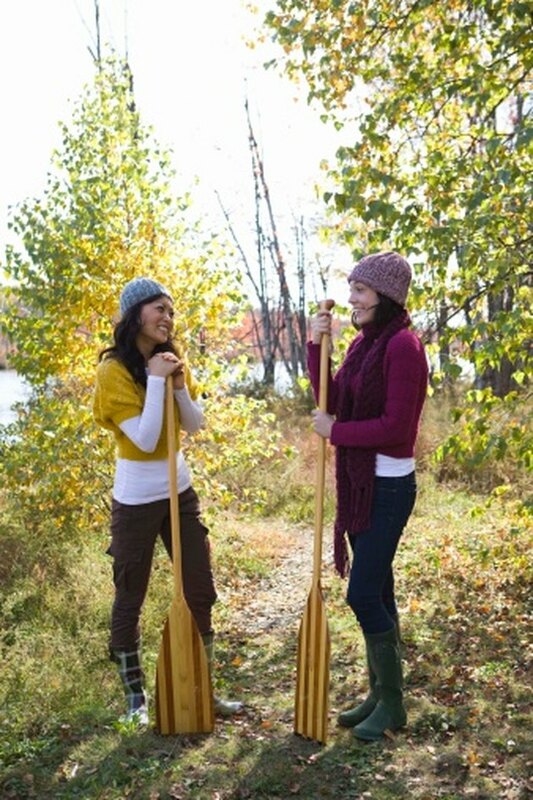 Select a wood tone that matches that of the oars. Also select a metal finish that matches other metal finishes in the room in which the oars will be displayed. Use the hanging hardware included with the coat hooks to attach the hooks to the wall. Pre-drill the screw holes; use wall anchors if the screws aren't going into a stud. Look for decorative towel bars that match the overall decor of the room. Search for towel bars with hooks at the end or those that protrude from the wall. Make sure the towel bar is long enough to accommodate the oar; it should be at least two-thirds the length of the oar. Hang the towel bar according to the manufacturer's directions. Nestle the oar in the hooks or between the wall and the towel bar. Hang your oars with decorative corbels. Choose stone corbels with openings large enough for the oar handle to slide through. Bring in Victorian charm with decorative wooden corbels. If you find corbels you like, but the handles won't slide through, balance the oars on top of the corbels. Use double-stick tape on the corbel and the wall to prevent the oars from sliding or shifting. Search for drapery rods with two rods — one for sheers and one for draperies. Choose rods in a decorative material, such as wrought iron, and equally decorative end caps. Install the drapery rods with the appropriate hardware, attaching it to studs when possible. Position the oar in between the two drapery rods.